The Dividist Papers: Return of The Dividist "10" Wherein we disagree with Nate Silver.Sort of. Return of The Dividist "10"
Wherein we disagree with Nate Silver. 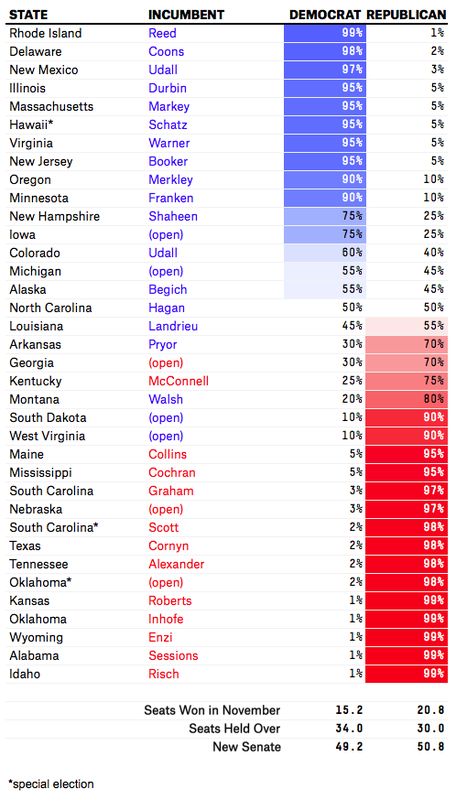 "When FiveThirtyEight last issued a U.S. Senate forecast — way back in July — we concluded the race for Senate control was a toss-up. That was a little ahead of the conventional wisdom at the time, which characterized the Democrats as vulnerable but more likely than not to retain the chamber. Our new forecast goes a half-step further: We think the Republicans are now slight favorites to win at least six seats and capture the chamber. The Democrats’ position has deteriorated somewhat since last summer, with President Obama’s approval ratings down to 42 or 43 percent from an average of about 45 percent before. Furthermore, as compared with 2010 or 2012, the GOP has done a better job of recruiting credible candidates, with some exceptions." Given we are still early in the primary season... Given the Republican penchant for nominating clown candidates in winnable Senate races... Given the hole the Republicans dug for themselves in the Senate in 2012... the Dividist is a bit dubious of Nate Silver's prediction. We'll come back to that. But first, let's consider one 2014 outcome that is not at risk in any meaningful way - the continuing status quo of our happily divided government. 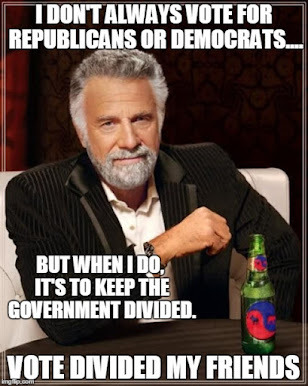 Americans voted for divided government in 2010, voted for it again in 2012, and all indications point to another vote for divided government in 2014. The President will, of course, continue to be President past the mid-term elections. Therefore the only possibility of united one party rule emerging out of the 2014 midterms is if the Democrats hold the Senate and retake the majority in the House of Representatives. That possibility is extremely remote. 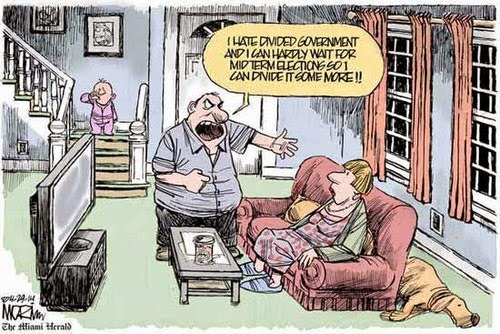 But to guard against that possibility the divided government vote in 2014 is to vote Republican. ...flipping majority party control of the House of Representatives is the most difficult of the three elected branches. And it is extraordinarily difficult indeed. Flipping the House has happened three times in recent decades - 1994, 2006, and 2010. All three required a nationalized wave election to overcome the incumbent advantage. All three nationalized wave elections were powered by a reaction against the overreach of unified single party control in Washington DC. In 1994 it was a reaction against the Clinton administration Unified Democratic Party Rule, Hillarycare, and the corruption exemplified by Dan Rostenkowski and Speaker Jim Wright. In 2006 it was a reaction against the Bush administration Unified Republican Party Rule, the overreach of the Iraq War, and corruption exemplified by Mark Foley and Speaker Dennis Hastert. In 2010 it was a reaction against the Obama administration Unified Democratic Party Rule and the partisan tax, borrow, and spend overreach exemplified by Porkulus and Obamacare. 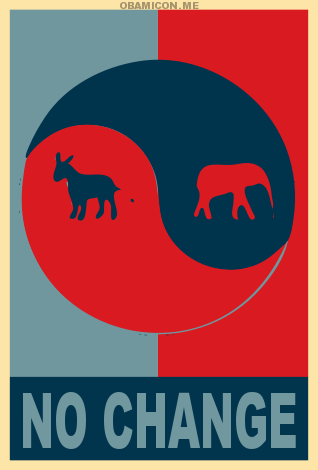 The conditions for a wave election against the Republicans simply do not exist in 2014. They are not perceived as the party in power, and disgusted as the electorate may be with Congress, it is a shared loathing for both parties and the administration. The Republican House majority is safe and, in fact, the GOP is likely to increase their majority in both branches of Congress. This is generally acknowledged by all the major pundits, including Cook, Sabato, Silver, and even President Obama. We stay divided. The Democrats control the Executive branch, the GOP has majority control of the House, and the Senate is up for grabs. Silver sees eleven Democratic seats at risk of which the Republican need six for a clear majority. I am going to concede Iowa to the Democrats, despite the ball cutting advantages of the Republican challenger. This brings us to a nice round number - ten key races to watch. Coincidentally, this also permits us to re-purpose the graphics from the our 2010 midterm prognostication (see graphic at top of post). While our past predictions were not a perfect "10", we'll give it another go. We didn't cover ourselves with glory with those 2010 (or 2012) forecasts, even after refining our forecast within a month of the election. In 2010 the Dividist was more optimistic about the GOP chances than Nate Silver (who gave the GOP a 1 in 4 chance of taking the Senate). We predicted they would get within a seat of the majority, perhaps even splitting the Senate 50-50, then flip a Senator or two to gain the majority. This year, we'll again risk humiliation by running counter to Nate Silver's forecast. Only this time we are more pessimistic than Silver about the prospects for a GOP Senate takeover. Our working assumption is the GOP will again under-perform despite their clear structural advantage, as they did in 2010, as they did in 2012, and will again fall a seat or two short of a clear majority. Lets really go out on a limb. The Dividist will once again predict a 50-50 split out of the election, just because it would be so cool. Plus it doesn't get any more divided than 50-50, and that makes the Dividist happy. The GOP will then secure the majority by playing the Prisoner's Dilemma Game with Angus King and Joe Manchin. Angus is an Independent and can caucus with with either party without paying a partisan penalty. Manchin already sounds more Republican than many Senate Republicans. First one to flip gets the choice committee assignments and chair of their choice. The second one to flip gets bupkis. Scott Brown was a bellwether in 2010. His stunning win to complete the late Senator Ted Kennedy's term was the first indication of just how big a Republican tsunami was in store. This year it's another story. After losing his reelection bid to Elizabeth Warren, he moved out of the liberal stronghold of Massachusetts to take his chances in neighboring New Hampshire against popular incumbent Jeanne Shaheen. It's early, he has not officially declared, the campaign is not really underway, but initial polls show him with a significant deficit. We don't expect him to win, but if he can turn it around it would indicate a bigger GOP wave than we are expecting now. And with that the Dividist Papers 2014 election cycle is now underway. So much for the New Year's resolution to write shorter, more succinct posts.